For simple, fresh food, Westville is the place to go, but though I'd eaten at the original Westville several years back and liked it a lot, its small size had always made it tricky to suggest it for meals and I hadn't returned since. Westville East to the rescue. With nearly triple the amount of seats as the original, BH and I managed to get a seat in no time. It's still not huge, but it can certainly accommodate more diners than their eighteen-seat West Village location. One of the notable features of this restaurant is their offering of "The Westville Market," which is a daily listing of seasonal fresh vegetable sides. For five bucks you can choose one, or for thirteen you can choose four, the latter being what BH and I decided to share as one of our two entrees. 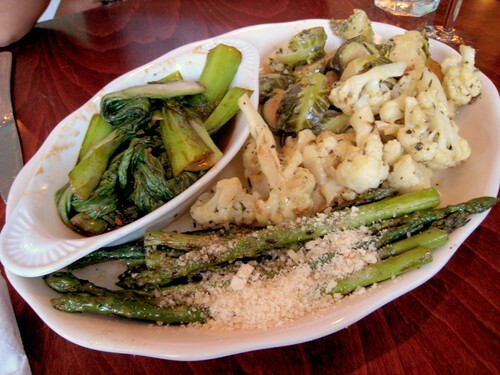 Above: cauliflower dijonaisse; brussel sprouts with honey dijon; Asian style bok choy; lemon grilled asparagus with parmesan. It's been a while since this meal, but I do remember especially liking the cauliflower and the sprouts. The only bummer was the "Asian-style" bok choy, which had been overwhelmed by a too-liberal dousing of soy sauce. 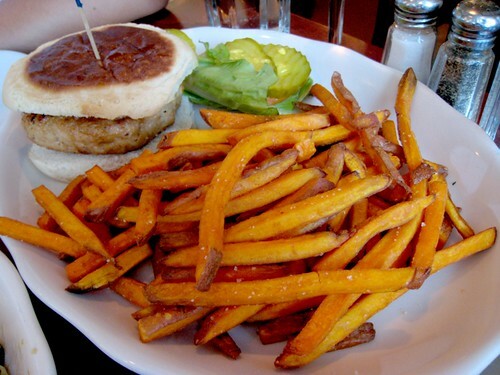 One half of the "cast-iron" turkey burger, which we requested with sweet potato fries. This was a generously sized burger, paired with pickles and tomatoes on a slightly sweet Portuguese muffin. The burger was juicy and flavorful, and the pile of fries deliciously crisp, too. 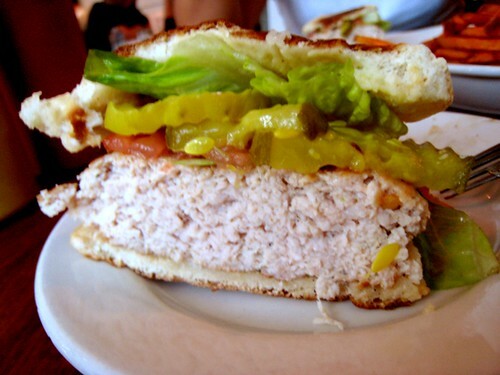 For a turkey burger, it might be one of the best I've ever had. Westville East had a tempting menu of desserts, too, but BH and I were happy after our veggie plate and turkey burger and opted to hit up a nearby bar for a beer instead, feeling quite virtuous after our hearty and semi-healthy meal.